My new favorite grass is this blowsy head of hair, growing at the Garden at Kendrick Lake (source of endless marvels)...it is Arrhenatherum calamagrostis. I think this is the form Lauren Springer Ogden brought back from Europe and introduced through High Country Gardens...this time of year it's just another tawny blond, but through the long summer months it is a chartreuse dream--at least 20 million times better than the vastly overrated, overplanted and just plain annoying 'Karl Foerster' grass (yes, I know..it has it's place: next to Perovskia down the street in my opinion! )...Tear all them suckers out and replace them with this hotty, I say! I know--snakeweed is not exactly going to enchant customers. Neither is Guttierezia sarothrae--although I understand it has been saddled with yet another unpronounceable and endless Latin epithet--phooey! It is true...this does often grow with snakes in the wild (of course there are snakes everywhere in the drier, lower elevations where it grows) but they will not follow it into your garden. It may be a weed of overgrazed pasture as well, but I have had a little trouble establishing it in my xeriscape, Here it is glowing in late afternoon light in the Plains Garden at DBG, which is just glowing right now! 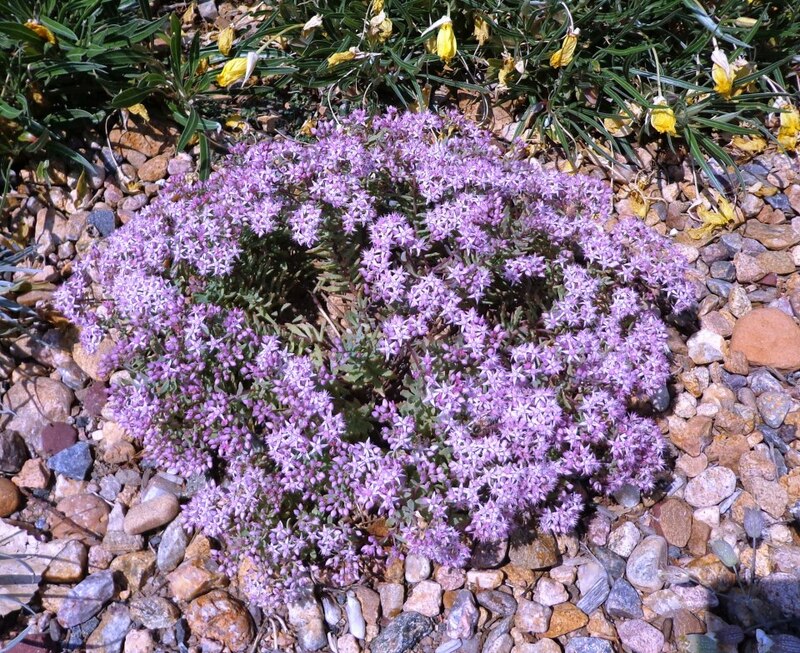 I am very fond of all sedums (don't hold it against me please! ), but this is one that even fussy snobs would approve of. Hylotelephium (if you must be correct--or Sedum if you are stubborn and basically right too) tatarinowii is a gem from the steppes of Mongolia I have grown for decades, usually in this glowing ivory form I photographed last week at Kendrick. Harlan Hamernik has been selecting pinker forms, which are occasionally available from Bluebird: see below (and die of envy! ): Kendrick is truly an amazing place...how many cities boast public parks full of unique and rare treasures grown to perfection and combined artistically? Lucky Lakewood! After all these mostly xeric, mostly sun loving (and some even native) treasures, it is perhaps refreshing to go back into the cool shade and admire the hardy begonia (Begonia evansiana): there is a floriferous and beautiful stand of these in the shade of the crabapples just south of the new Orangerie at Denver Botanic Gardens--the white form no less. We have had the deep pink under the river birch in the Rock Alpine garden for over a decade, but the spot is perhaps a bit too sunny or dry and it's not performing as well as these. I have yearned to see this in Colorado, and looks as though it has finally gotten properly established! 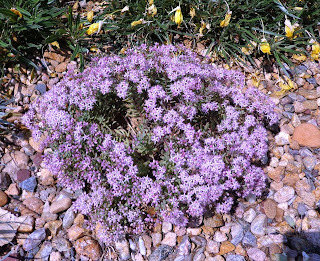 Leo Chance in Colorado Springs has grown Lithops salicola outdoors for years (multiple generations as a matter of fact), and Rebecca Day Skowron has had blue Meconopsis thrive for decades...I have had Eritrichium howardii in a trough for fifteen years, and we have overwintered over twenty kinds of Agave: from cactus to begonias--that's Colorado in a nutshell! Nice selections...and probably just narrowed down to a few, for you! I'll take most sedums over Russian Sage or Karl F-grass - except those tortured on the eco-sustainable, spray-irrigated "green" roofs here. "Chihuahuan Highlands of southern Colorado" - I like that, and never thought of it that way...but it has merit. If only our blackfoot daisies were like that away from irrigation this year...maybe soon. They and chocolate flower sometimes don't stop in Abq, until just after Thanksgiving. All these plants are very different from what I grow. I was out to a restoration today. The tall grass prairie is in its late summer splendor. I saw a prairie gentian in bloom. This one is always a highlight for me. David: I consider the Chihuahuan uplands to extend into the Arkansas Valley of southern Colorado (we have so many plants that stop just short of Colorado Springs: just think Zinnia grandiflora, Cylindropuntia imbricata, Gilia acerosa, Teucrium laciniatum, Echinocereus reichenbachii, coccineus, fendleri, triglochidiatus all make it up that far (and many many more). The Monument Divide sees the end of Quercus as well--a few stands barely making it to Denver...We should cede the whole of that area to NM! And as for you, James--the Southern Rockies are very different indeed, but northeastern Colorado has more affinities with you than Chihuahua! I would love to see Gentiana pulverulenta--a plant high on my bucket list! I posted a photo on this thread if you scroll down.